The White Rabbit may always be late to his important date in the Alice in Wonderland fairytale, but you'll definitely want to be the first one to the party when you're wearing this one-of-a-kind authentic costume! 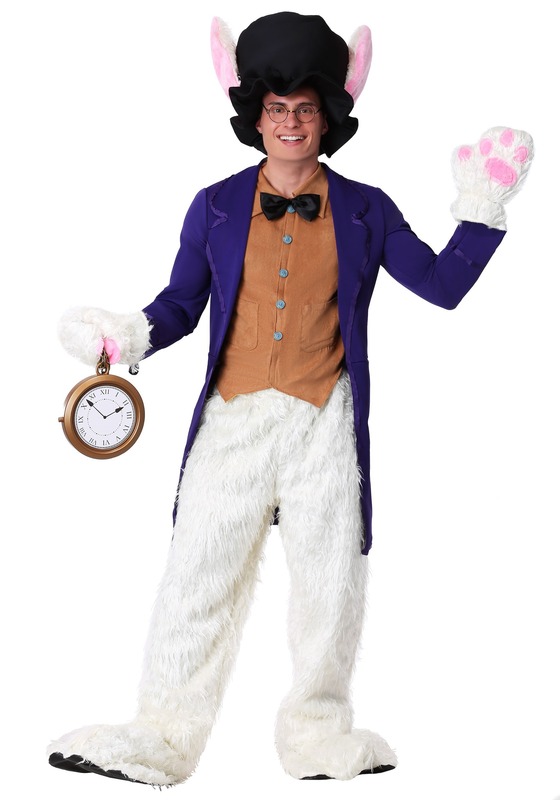 It's a detailed costume that includes pants, mitts and slippers of luxurious long-pile 80% polyester/20% acrylic faux fur; a jacket, vest, and top hat with rabbit ears. The pants have an elastic waistband. The slippers have anti-skid faux leather soles, and the mitts have appliqued pink paw pads in the palms. The knee-length jacket is purple polyester poplin. The brown polyester faux suede vest fastens with Velcro tabs concealed behind decorative blue buttons at center front. It has a black satin bow tie sewn at the collar. The top hat is black polyfoam, and has a large white fur ear on each side. Tthere's no way anyone will mistake you for any old regular rabbit. You'll look like you just walked out of the Alice in Wonderland fairytale! Now, don't be late to order this costume!